EUROPE'S BIGGEST HOCKEY STADIUM NOW IS FINISHED! The Warsteiner HockeyPark in Mönchengladbach is Europe’s biggest and most modern hockey stadium. 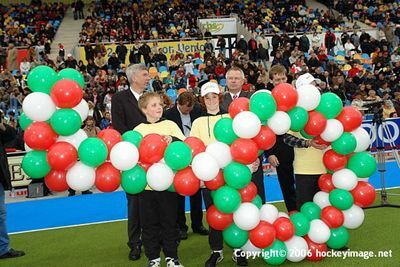 The construction was started in August 2004, the laying of the foundation stone was in October 2004, the arranging and naming celebration was in April 2005, and the official opening celebration took place on 15th of April 2006 in the context of a 4-Nation-Tournament. Two fields are available and there is one additional field on the backside of the grandstand. 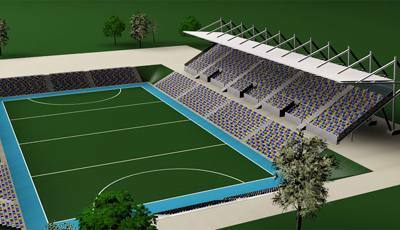 The additional field is also equipped with floodlights and a stand for 850 spectators that is made of turf steps. The main field is surrounded by five stands that offer space for more than 9.000 spectators. Mobile stages can be added to increase the number of spectators up to 14.000 and as a matter of course that will happen at the world championships. The three-storeyed building vis-à-vis the grandstand is seat of the office of the Deutscher Hockey-Bund since 11th of March 2006. The Warsteiner HockeyPark is not only built for playing hockey. Different events like concerts, Park parties and other sport events are planned. Camera teams and journalists from around the world will report on the world championship from the Warsteiner HockeyPark for two weeks, and international guests will visit Mönchengladbach: "We will welcome the hockey world and show them a city full of hospitality and a love for sports. Mönchengladbach knows how to make guests feel at home."